← GRUMBLE … or … HUMBLE? POWER UNPLUGGED . . . HOW’S YOUR BIBLE INTAKE? The Lord Jesus Christ said the same power that raised Him from death to life is the same power that resides within every Christian. There’s a question we must ask ourselves: “Have we unplugged from the power source?” You see, this power has been promised to every Christian. We have this power within us. The challenge is whether we are appropriating it or not. What I mean by appropriate is have we taken possession of the power? Have we tapped into it? Have we plugged into it by engaging in the means of grace God has given us to strengthen us in our walk with Christ? To be sure, the Holy Spirit often acts in a completely sovereign way in our lives, apart from any appropriating work (disciplined effort) on our part. Praise God for that truth! Yet the Bible makes is crystal clear that God expects us to plug into the power He has given us in order to live the life He is calling us to live. Today we will look at one of those means of grace and throughout next week we’ll examine a few more. God wants us in His Word because He wants His Word in us! It is alive and active; it shines light into our world and into our souls (Hebrews 4:12). Every time we go to the Bible we are changed by it. You’ve probably had this experience: you have read the same passage of Scripture dozens of times before, but this time you read it and see something you never saw in the past. Why is that? Because you are not the same person you were the last time you read it! The Word is life-giving . . . imparting new life into the heart of the believing reader. So . . . how are you doing in the area of Bible intake? 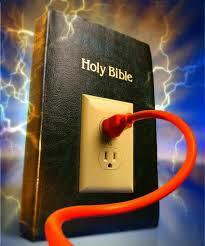 Would you define your Bible reading as “plugged in”? Or “unplugged”? Remember, the book you don’t read won’t help.